(1) Caroline Baum asks a probing question: if the Fed is not able to identity an asset bubble and prick it in a timely fashion, how then is it able to know what are appropriate spreads in the credit market as it expands it balance sheet to shore up the financial system? In the former case it claims ignorance and refuses to intervene while in the later case it claims prescience and readily intervenes. Baum notes this asymmetry is typical of Fed policy in recent times. (2) Has the Fed’s independence already been compromised? Nouriel Roubini and Ian Bremmer argue yes and its not because of congressional probbing. Rather, it is because of its bailout of large financial institutions last year. Roubini and Bremmer also explain that if the Fed is not careful it could set the stage once again for the next bubble, a point recently made by Peter Boone and Simon Johnson. 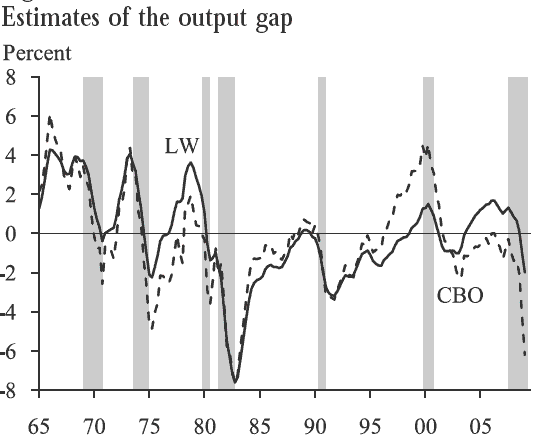 The CBO measures show a negative output gap during the housing boom while the LW measure shows a positive output gap. The LW makes more sense for this period. Now plug the LW measure into a Taylor Rule and there is even a stronger case that monetary policy was too loose during the housing boom period. Finally, there are other ways to learn the stance of monetary policy. Here is one measure I like.